I’ve had my BMW ActiveE for 6 ½ months now and the odometer shows I’m about 300 miles short of the 20,000 mile mark which puts me on pace to drive it about 36,000 miles this year. That means two things for sure. First I drive way too much, and secondly I plug this thing in a LOT to recharge the batteries. I keep detailed logs of my driving which include the range, ambient temperature, type of driving, average speed, and so on. By doing so I can see if the car has battery degradation over the course of the two years I have it as well as understanding how temperature, driving characteristics, the use of air conditioning & the heater all impact the cars range. This allows me to really map out what the cars range is under all these different conditions which is useful when you are planning longer trips so you’ll know when you need to recharge in advance. I know most people don’t want to bother with this complicated graphing and detailed data mining, so for them the car has an “estimated remaining miles” indicator that does a pretty good job of letting you know how much further you can go before you need to plug in. My problem with that is the car can’t possibly know how fast you’ll be driving or if you are going to start blasting the heater or if you’ll be driving up a mountain. My data includes all that so I know exactly what the car can and cannot do under different conditions. That’s important, because once you’ve learned the limits of an electric cars range, you quickly don’t worry about it anymore because you know you’ll make your destination. A quick look at my charts show that I’ve plugged in 420 times so far which means I average about 47 miles between recharges. Sounds like a lot of work doesn’t it? We’ll, it really isn’t. It only takes about 5 seconds to plug the car in. If I were driving a gas car I would have had to fill up about 65 times over the same period. That means driving to a gas station, taking 5 -10 minutes to fill up, pay and then get back to my previous driving route. So I would have wasted over 7 hours of my life sitting in a gas in just six months – I think I’ll pass. When I plug in, I’m already at where I was going to go anyway, like my garage or workplace. I don’t drive somewhere to refuel, I refuel while I’m doing what I always do, like work or sleep. This is something that people who have never had an electric vehicle have a lot of difficulty getting their hands around, and understandably so. We have become so conditioned to the refueling process of gasoline that anything else sounds foreign and cumbersome. Everyone asks “How long does it take to charge?” and while I do tell them 4 to 5 hours if it was completely empty, I always add “But I’m never waiting for it to charge, I plug in and do what I’d be doing anyway.” I drive a lot, but even I only spend about two hours a day in my car, so for 22 hours it’s parked somewhere. It might as well be plugged in and charging. Electric vehicle charging really reinvents the refueling process because unlike gasoline you don’t purposely drive to a refueling location to fill up and then repeat the process in a couple days once you are close to empty. With an electric car, you plug in every night when you arrive home and in the morning you leave with a ‘full tank’ every day. If during the day you have the chance to ‘top off’ somewhere like work, or at a shopping center you plug in there also. This is representative of 99% of my personal experience with the remaining 1% the times I need to drive further than the ActiveE’s 100 mile range will allow. In those instances, I either take our other car for the day and let my wife drive the ActiveE (which she loves!) or I’ll use one of the many smartphone applications that map out the locations of public chargers. New Jersey now has about 150 registered public charging stations, and they had less than 10 as recent as two years ago. That’s encouraging, because a robust public charging infrastructure will certainly expedite the widespread adoption of electric vehicles. Even if people don’t use them that much, just having them there is important to ease the fears people have of running out of charge during the day. Plus, even with paying a premium to use a public charger you still spend much less to drive on electricity than it using gas. When I charge at home it costs me about $5.00 to ‘fill up’ and if I was using a public charger it might cost about $8 or $9, but pricing varies. For that I can drive about 100 miles. I have a solar array at home so my electric expense is actually very small and some months zero, but I used the market rate for comparison here. 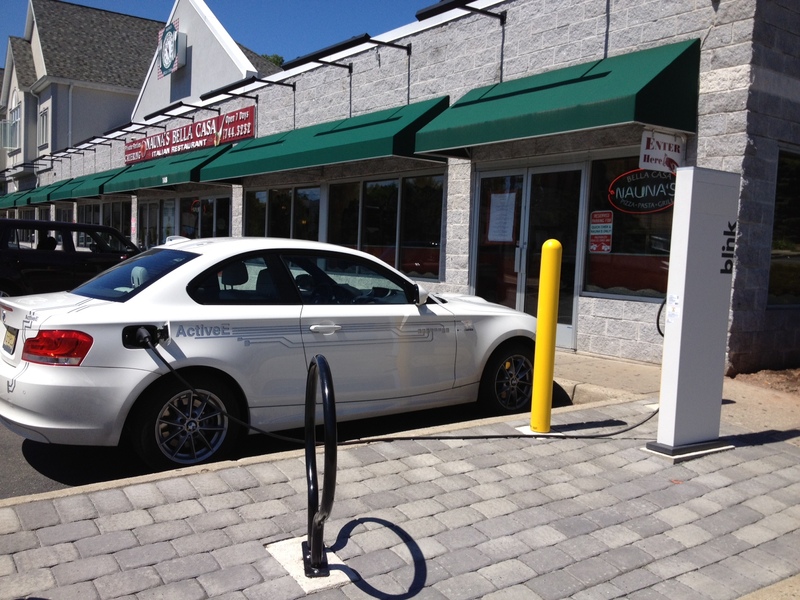 I recently installed two public charging stations in the parking lot of my restaurant in Montclair New Jersey. Immediately they began to be used which was really encouraging. In addition to a couple ActiveE’s I’ve seen Chevy volts and Nissan LEAF’s plug in and come inside to eat. My policy is if you eat at the restaurant while the car is charging your charging is free, otherwise it’s $2.00 per hour. I had a press conference when we installed the chargers and we were featured on the NBC 5:00 news in New York as well as written up in local newspapers. All great PR for both the electric car industry and my restaurant. So far the ActiveE has been a blast. It has the smooth linear acceleration and quiet cabin you expect in an electric vehicle, and the fun-to-drive quotient you expect in a BMW. I really can’t wait to see how the BMW i3 drives. It’s planned to be introduced next fall and has the same powertrain as the ActiveE(184lb-ft torque and 170hp) but weighs 1,300lbs less so performance should be excellent. The Life-Drive architecture used allows a large portion of the weight of the car to be at or below the axle line which I’m told makes it handle like it’s on rails. I just hope I don’t wear out the plug on my ActiveE before the i3 is available!